I have never lost a ball on every hole when playing a golf course. Never! And it's very seldom that I want to play the same golf course twice in a row. But this Gary Player design is a definite challenge to anyone who has not set foot on it before. Its 2002 rankings alone are impressive. 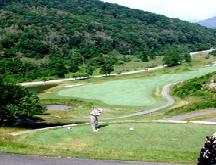 Golfweek ranked it #15 in the Top 40 Resort Courses in America and #1 Public Access Course in West Virginia. Don't forget, this state is also home to first class golf resorts like the Greenbrier and Glades Spring, so there is strong competition for these rankings. But if you're like me, you don't consider these rankings very important unless they become reality. And they do at Raven Golf Club at Snowshoe Mountain! Raven is fairly new, having opened in 1993, and only recently became part of the Raven family of courses managed by Intrawest. But there is not doubt this is mountain golf at its finest. With dramatic 200-foot drops from the tee to landing areas, nearly each hole offers spectacular views of its surroundings. 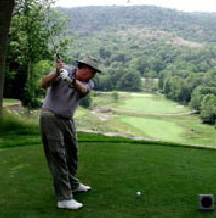 The layout winds easily throughout the Allegheny Mountains, with manicured greens only feet away from the surrounding woods and numerous wildflowers. We played this course in June and, despite the rain, enjoyed it tremendously. After just a couple of holes, we realized we might as well treat the first round as practice and return the next day to try to master its layout. We did lose about a dozen balls, but we managed to find just as many others! It is inevitable that if your ball lands in the rough, it's gone! In fact, this rough reminded me of the tall grass of Ireland's golf courses, which is one of the reasons for their reputation as tough layouts. It was difficult to determine which was the signature hole. We later found out it was #13 - the 8th most difficult. But just as easily it could have been any of the 18 holes. Originally, the front nine were designed as the back nine, which explains why the practice range is located by the 18th hole and the 9th fairway is the one you can see from the clubhouse. Four tee placements allow golfers to play a fairly short 7,045-yard layout from the black tees, or a much shorter 4,363 from the gold. We figured we could play a more standard 5,976 length from the white tees (in fact, the starter told us only men age 65 or over and women played from the gold tees). However, we quickly found out that the hazards and wild areas between the tee boxes and the fairways often provided carries of over 200 yards off the whites! So our game developed into a two-person best ball to avoid much frustration! I do admit that my favorite hole is the #3 par 3. 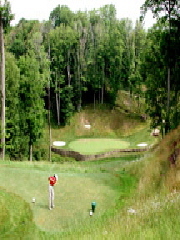 The white tees are 140 feet above the green, while the gold tees are across a gaping ravine which borders the front of the green. A well hit 9 iron will get you on the green. In addition to the tough layout, the course's maintenance was a pleasant surprise. When I hear "public course" my expectations are often different regarding a course's maintenance, customer service, equipment, etc. All these expectations were immediately gone just a few minutes after we arrived. Our rental equipment (Ping golf clubs in Callaway bags) could not have been in better condition. The golf carts are gas powered, which are the only way to climb the steep hills throughout the course. The carts also include a simple GPS system, very helpful to determine your next shot! We were also very impressed with the dedication of the maintenance staff we encountered throughout the golf course both days. When we complimented them on the condition of the course, one of the guys complained that it was still not up to his liking! In Florida, wildlife on a golf course means an occasional alligator or snapping turtle, or a wide variety of wading birds. At Raven Golf Club, our game was observed by several deer munching on the wildflowers at the edge of the woods, or by a flock of Canada geese. We also saw wild mink, and the remnants of a beaver's dam. It certainly added to the "wildness" experience that the course layout offers! 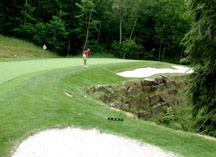 The Raven Golf Club at Showshoe Mountain is most definitely the type of golf course that players of all skill levels are looking for. For experienced golfers, we challenge you to play off the black tees. It may hurt your ego, but you will learn to play with your thinking cap as well as your clubs. For the more inexperienced golfer, you won't care if your game is terrible because you will be enjoying the fantastic scenery. Either way, you will want to play this course more than once; it will require different strategies each time you play it. In addition to the excellent playing conditions and the scenery, golf packages are extremely affordable. Check flight and hotel availability!